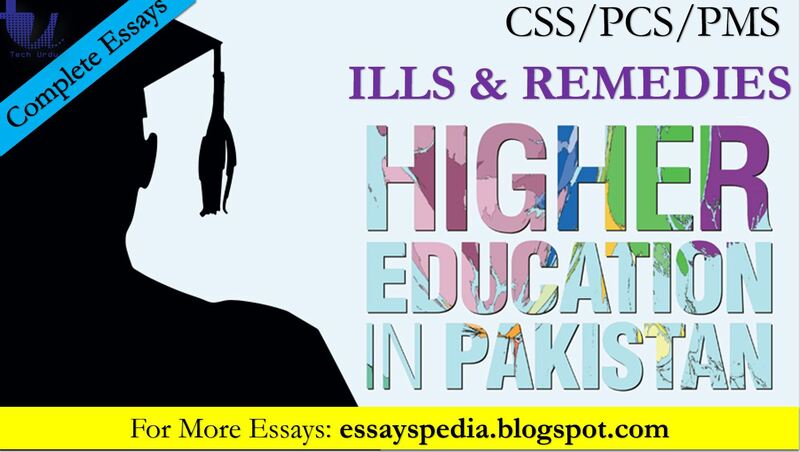 November 23, 2018 Naeem Javid	0 Comments Complete Essay with Outline, CSS/PMS/PCS Essay, Higher Education in Pakistan - Ills & Remedies, How to Improve the Quality of the Higher Education System in Pakistan: Remedies, What is our Government undertaking to Improve the Higher Education System? What is our Government undertaking to Improve the Higher Education System? With the mammoth demographic dividend, higher education is instrumental for Pakistani youth. The young country is ravenous for the best quality education. However, still, the glass is half empty as always. The higher education in Pakistan is fettered in copious ills. The predominant ones that rub salt in the wounds are conventional methods of teaching and rising cost of education. Likewise, rote learning and marks structure are amongst the biggest flaws in our education system. Similarly, the mismatch between the qualification obtained and skills required besides Low GDP investment in higher education further fan the flame. Though these malaises plagues the higher education system of our country, yet it is possible to overcome these touches of melancholy. In order to revamp the education system in Pakistan, a strong commitment to research and knowledge is elementary. Additionally, the reduction in the cost of the institutions is candidly significant. To focus on investing in technology is explicitly consequential, rather than outdated brick and mortar institutions. Redesigning the institutional imagination that we have is vitally-important in this regard. Instead of aiming at getting a job and indulging in a rat race, our education system needs to focus on creating entrepreneurs, innovators, scientists, thinkers, and writs. We also need to focus on the implementation of the policy framework. Therefore, it is high time we changed our approach towards higher education. The present situation of higher education in Pakistan is dismaying. Several ills are prevalent in our education system. The foremost ill is the rising cost of education balanced against the benefit of a university degree. As valuable as a university education is, the cost is often important issue people face in weighing the value of universities. Though success in the workforce usually requires a higher education, the ability to pay for the university has become difficult for many. One thing is certain: if the cost of higher education continues to outpace the ability of the middle class, the problem is going to snowball. Similarly, Owing to uncreative financial solutions for strapped students, the situation further deteriorates. There is hardly any culture of offering online classes so that students do not have to pay for campus housing, meal plan, and others. Growing privatization of public universities in our society linger on. Acquiring an education is a fundamental human right. Without providing cost-effective education, progress and prosperity of the country is an impossibility. In the present times, it has become a serious challenge for many parents, given their economic situation, to sponsor their children to pursue higher education even in a public university. In this scenario, privatization of education is equivalent of adding insult to the injury. As funding for higher learning institutions decreases, universities seek funding from private sources. As a consequence, universities begin to fund themselves through a combination of student tuition and other businesses interests. Obsolete methods and outdated curricula are still ubiquitous in this epoch of modern technology. By and large, teaching methods are not moving away from the old-fashioned model of lectures. These methods make students more passive. In most of the reputed universities, the still out-dated syllabus is taught with conventional methods. In high ranking universities, such as UET Lahore, NEDUET Karachi, Aga Khan Medical University, Karachi and University of Health Sciences, Lahore lecturers and professors conduct classroom lectures. Top universities namely, Harvard, Stanford, and Warton continuously involve students in project-based problem-solving case studies. Therefore, Benjamin Franklin has aptly remarked that: Tell me and I forget. Teach me and I remember. Involve me and I learn. High-quality faculty conundrum is another ill that our higher education system is going through. The quality faculty is indispensable for the quality education and research. Without competent faculty, providing qualitative education remains a far-flung dream. In our education system, there is a severe dearth of eminent professors and lectures. Similarly, Pakistani universities lack research owing to the shortage of quality faculty. The most compelling evidence is that, since the inception in 1947, our country has not produced a single ‘original thinker’. Besides, shortage of best faculty, our universities also lacks PhD holders. As higher education commission (HEC) mentioned that our country is in need of thirty-six thousand PhDs. Therefore the nation expects Pakistani universities to contribute to basic and practical research to help minimize the problems of higher education. An absence of Strong commitment to research and knowledge creation is the depiction of the fact that our system is in a serious quandary. A key factor in the production of knowledge is the existence of research-intensive, knowledge producing, institutions. An inability to attract and retain high performing researchers negatively impacts the productivity of the institutions. Many examples are present in our country that shows the grim picture of our education system. Instead of practical research and knowledge creation, Pakistan’s pseudo-science menace is reaching new heights. For instance, Sultan Bashiruddin Mahmood, Pakistani nuclear engineer proclaimed that: ‘Solution to the energy crisis in Pakistan is to generate electricity from the ‘Jinn’. His research was lamented by Professor Pervaiz hoodboy. Such impractical solutions are the reflection of the fact that, there is a dearth of practical research in our country. Note: Include plagiarism angle too. No focus on innovation in the institutions further pile up the ills of higher education in Pakistan. Innovation is unequivocally deficient in our higher education system. Low standards of science education in our educational institutions are reflected on variegated fronts. Without any shadow ambiguity, Pakistan lags behind the world in innovation. It’s a pity that Pakistan ranks at 131 out of 141 countries in the Global Innovation Index. This spearheads economic growth and development to jump Out of frying pan into the fire. Similarly, HEC’s fallacious policy criterion emphasizes only on quantity, with little or no emphasis on quality shows that our education system lack creativity and innovation. It is imperative to be mindful of the fact that not even a single Pakistani research journal in the field of engineering has received international exposure, or impacted the scientific community at large. Low GDP investment in higher education than requisite is a challenge to our education system. This ailment also results in hampering the development of the nation. As education and development have a direct link with each other. Without investing in education, the prosperity of the country remains a castle in the air. Education is an area that attracted the least focus of the government. This reinforces the idea that is education not a priority in Pakistan? Our country’s Public expenditure on education is estimated at 2.2 percentages in the fiscal year 2017, which is the lowest in the region. Pakistan’s total Education spending does not surpass its defence budget, which makes our country a security state rather than a welfare state. Lacunae between the qualification obtained and skills required pose a serious threat to our higher education system. This Mismatch between the skills essential and the education obtained the result in unemployability. According to UNESCO Pakistan in present times spends 2.2 of GDP on education whereas, India spends 3.8 per cent. Developed countries like UK Germany spend 5 per cent. In the same way, rote learning and cramming culture are amongst the biggest flaws of our education system. It encourages cramming and forgetting rather than lifelong learning. In such a flawed system, students study only to score marks in the examination. These sorts of practices defeat the purpose of higher education. As a consequence graduates are ill-equipped in terms of skills and knowledge. Nonconducive academic environment, the adjunct to it, is another ill that haunt the higher education system. The friendly milieu is pre-requisite for education. Acquiring quality education in the non-peaceful environment is a far-flung dream. : Religious and political wings in universities are a serious threat to the healthy functioning of the institutions. It is imperative to be wary of the fact that campus violence is on the rise in our country. According to media reports, most incidents of violence are reported from Punjab University (PU), Karachi University (KU), Quaid-i-Azam University (QAU), International Islamic University Islamabad. Clashes among political and religious wings raise tensions and disrupt academic activities. Our government is endeavouring to surmount mare’s nest of higher education. Since her inception in 1947, Pakistan has introduced nine education policies. The first education policy was introduced in 1947. With chequered national education policies, the recent education policy was introduced in 2017 by the Ministry of Federal Education of Pakistan. The major programs and targets proposed for the promotion of higher education include: increase access from the current 8% to 15% of the 17-23 age group. increase number of sub-campuses of Virtual Universities to provide education at the doorsteps of working men and women and so forth. However, these policies are lacking practical implementation and no concrete steps have been put forward in this line. Merely, introducing education policy is not a sufficient way to address the predicaments of higher education. Government is committed to implementing these policies. Despite governments endeavours to cope with the chronic problems of higher education, the ghost of ills are still chasing us. The miseries in the higher education system are abundant, ranging from the rising cost to cramming culture. At the same time, thwarting this quandary is attainable. FIRST and foremost, making university education affordable is the cry of the day, in order to console the doldrums of higher education. In recent years, the cost of the university education skyrocketed. Due to the rising cost, students either don’t enter into the university or drop out from the university. Consequently, we need to overcome this dismal situation. There are many ways to make university education more affordable. For instance, by improving the productivity of the sector so that students learn as much, but at a lower cost. Additionally, the government needs to provide incentives and subsidies amid proper accountability and transparency. Second, public-private partnerships are presented as capable of resolving the issues of our higher education. With stagflation of education and privatization of institutions, acquiring higher education at present times has become difficult. Through innovative partnerships with leading universities, we expand opportunities for higher education. This also ensures student and staff success. Similarly, these developments have the potential to transform the higher education system. Many countries have collaborative partnerships with private Institutions. One such country is Australia. Marginson and Considine mentioned in their book that, public-private partnership transformed their whole system of education of the country. Third, the remedy is that we need to focus on a strong commitment to research and knowledge. Research is possible in the ecosystem in which faculty members have inspiration from faculty members and peer groups as well. The foregoing discussion implies that research thrives on the discussion. It flourishes when various groups freely discuss differing viewpoints. Unlike universities like Harvard and Stanford, our education system is based upon classroom approach. This conventional way of teaching provides a well-filled mind, not a well-formed mind. Therefore, it is time to change this approach. In this regard, we need to develop public policy reforms which identify the true talent of every school, college and university across all disciplines to nurture them to research and knowledge creation. Fourth, redesigning the institutional imagination that we have is indispensable to solace the misery of higher education. Syllabus and theories taught in the Pakistani universities are hardly upgraded. Syllabus rarely gets revised. HEC undertakes the revision of curricula after every three years through respective National Curriculum Revision Committees (NCRCs). Nonetheless, the mismatch is there between policy formulation and its implementation. Therefore incorporation of innovative theories and methods in design courses are instrumental to stimulate students’ imagination to enhance their performance and skills. Because the aim of the study is to explore the creativity and imagination to inspire university students to produce works by instructional design. Fifth, we need to create institutions of excellence that equip students to excel in their professional lives. In the scenario, where institutions lack quality, producing workhorses remain a distant ambition. In order to impart quality education which is at par with international standards, it is of paramount importance to create institutions of excellence. Unequivocally we need quality. Therefore we need to set up high-quality institutions. National University of Sciences and Technology (#501), Quaid-i-Azam University are good examples. These are good examples of quality education; however, the average Pakistani higher education institutions are simply not of the quality, that we all are poised to see. Sixth, including the excluded from education, is an equally important remedy to overcome the dilemma of higher education in our country. We need to fight for equity that is including the excluded from the education. Our country needs to reach out the unreached. The people who failed to get a fair share in the education, for the reasons they could not help: gender, an obvious reason. According to the recent economic survey of Pakistan still, the female literacy rate is lower than the male literacy rate. Similarly, owing to the discrimination on the basis of caste, religion, all sort of people that have been left out of the system. Pakistan is committed to bringing them into the system. This needs to be the priority of our education system. Seventh, navigating students through the dilemma of underemployment is the cry of the day. Pakistani universities have been producing over half a million graduates, including over 10,000 IT graduates, every year since 2010, according to HEC data. At present times, either university graduates in Pakistan are unemployed or underemployed. Parents with ambitious dreams, taking hefty loans, send their youngsters to acquire graduation degrees. Owing to the shortage of good faculty in Pakistan, corporate campus and university campus have become two different entities. In such a scenario, there is a huge mismatch between Students’ level of aspiration and level of preparation. With the rise of automation, artificial intelligence, and lean management process, job rates are taking nose-dive. Similarly, our education system is just producing graduates with their heads filled full of facts, textbook materials, and teacher’s lectures. That gives a well-filled mind. But in the era of the internet, a well-filled mind is not required. We can find out anything with two clicks of the mouse. What is looked for is a well-formed mind. A mind that reacts to unfamiliar facts and details that actually synthesize information that has not been studied before. A mind that has the potential to react, to the bigger examination called life. For that we need a mind that is shaped by original thinking, a mind that doesn’t just ask the teacher why, but why not. Therefore, if the education system provides quality education people are empowered to get jobs. So, education in our country is not just a social or an economic issue. It is even a national security issue. We have got to equip our people to take advantage of, what the 21st century is offering. The Diogenes Laertius has aptly remarked that the foundation of every state is the education of its youth”. To encapsulate, Education is a cornerstone of development. Education provides people with the tool to raise their standard of living and break down the barriers of gender. At the same time challenges in the higher education system are enormous. Defacto education in Pakistan is in a juvenile phase. The prominent ills that impeded our education system to blossom were redundant curricula, unaffordable campus fees, early dropouts, and underemployment. Our government made certain efforts to overcome this grim situation, such as national education policy and fees reimbursement schemes. However, these efforts are necessary but not a sufficient way to address the quandary of higher education. Therefore, vanquishing the situation of higher education has become exigent. In this regard, we need to build institutions designed for students’ success. Similarly, supporting students’ through financial aid cycle is equally important. Moreover, we need a strong commitment to research and knowledge creation. It is pre-eminent to create an ecosystem for the faculty members to advance this agenda. The essays included here are from numerous sources or authors (sources mentioned in each essay). The most important question is ‘how to write an essay?’ The answer varies from person to person. Yet, the main purpose of Essaypspedia is to give you an idea of the essays. It is now up to you, being an aspirant of the competitive examinations, to edit/update/improve/add in it.